I am so far behind on reading A-Z blogs, even the ones I already follow. Hopefully I can catch up this week. Because there are no more baby showers. Just going to pick up the wheat order, and getting garden things done. Blah, speaking of which, we have a possibility of snow flurries on Monday. It’s 80 degrees outside as I write this, and in less than 48 hours, we might have SNOW falling from the sky. Oklahoma is seriously messed up, ya’ll. Goal: 40 hours of editing on Catalyst, plus 20,000 new words written.Er, yeah… no progress from last week. N-Z posts written by April 15th. Visit at least 5 new blogs each day, and comment on at least 3 new blogs each day.I got ‘P’ written and scheduled! And… I haven’t made it to any new blogs this week. Pre-write May’s ‘feature’ blog posts, and start planning for June. 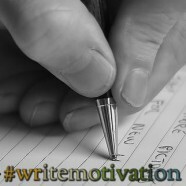 This goal is not coming off my #writemotivation list until I complete it. I am determined.Still searching for the stock papers… they’re not actually IN the filing cabinet, which means that I get to search the to-be-filed box next. Wheee. Finish reading Numb by John W. Otte for the CSFF Tour. Make progress on The Way of Kings by Brandon Sanderson. Read another book, or several…I should charge my Kindle tonight. There’s a forecast of snow for where I live tomorrow too. Had rain/snow mix yesterday. I think spring is a myth this year. It is very much a myth. It seems like we’re just going to hop straight from winter to summer here. And even then it can’t make up its mind. I’ve been busy, too! Between working 14 hour days, doctor appointments, errands, and cooking! ugh! I need a few days…. *hugs* we all need a vacation, it sounds like! Just curious. Is this wheat to grow or wheat to grind for flour? Wheat to grind for flour. I assume it IS viable for seed, but I just don’t have the space/energy for that yet. Dear, the fact that you are TRYING to keep up with reading A-Z is admirable. Tell that to my Feedly account of nearing 400 posts…. I’m still poking, but I’m nearing giving up on all but a few.